the safety problem of bolt connections. Their exclusive performance is provided by their serrated surfaces. S series and VS series offer the best safety thanks to their less shaking. The smoothly chamfered serrated surface is evenly pressed on the interface of bolt connection and safely presses the connecting parts to prevent their relaxation. 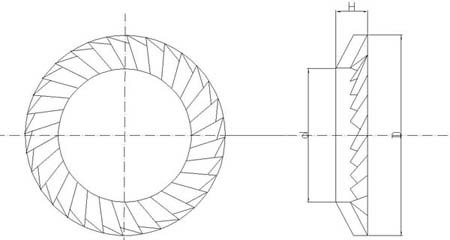 The deformation amount (H-S) of disc springs maintains certain pressure on nuts. The inside frication of serrated surface offers extra protection against relaxation. S series are standard load, VS series are medium load. They can be made of spring steel and subject to quenching, surface blackening, and can also be made of stainless steel, phosphor bronze, and other surface treatments include galvanization or Cd plating. Toothed check washer includes S series and VS series, which can be used to prevent against the looseness of bolts incurred due to vibration by increasing the frictional resistance after the connection of washer and bolt.